Home › Uncategorized › PGC – Paragon Care Limited looking better! PGC – Paragon Care Limited looking better! Ten Bags Full is a community of traders’ website which provides a range of research tools, as well as sharing stock information, and perceptions It highlights particularly the microcap stocks which are not usually covered by stock broking analysts. Sure many such stocks are high risk “fly by night” ventures which will never dazzle the eye in daylight. Denigrators might assert that such websites as TBF, growing in popularity, are simply forums for unschooled financial rants. But there is much serious content. It is a self-help tool for finding investment gems. Paragon Care Limited (PGC) is one such a stock that has been widely canvassed over the past two years, drawing many comments and posts from those who have invested in it or at least followed its fortunes. I made a contribution to the debate on the 11/4/2013 writing the following observations. From a low of 19 c on the 7/12/12, the share-price more than doubled to a high of 43.5cc on 1/02/13 in anticipation of an improving half-year profit result. After the result was released, shareholders dumped stock on the market, suggesting that many had been looking for a suitable time to exit their positions. Since then the share-price has retreated to a low of 28c on April 5 before rallying to now be trading about 31c. The share-price would have to lift above resistance at 34c to arrest the present down-trend. Breaking of support would probably lead to the next firm level at 19c. The company operates in the health and aged care sector supplying a variety of medical care items. This is a good field to be in, but Paragon’s share-price has virtually gone nowhere since it was floated at about 40c in October 1999. The recent good profit result was due to a contract to supply equipment to the Royal Children’s Hospital. This revenue boost may not be repeated in the next year. The company metrics are not inspiring either with Trailing P/E of 39.38, return on assets of 1.93%, and return on equity of 0.42%. One would do better with even the lowest yielding bank account. At least the capital would then be protected by the government guarantee. I think there is better value elsewhere. Recently this stock has again featured in TBF, and one contributor has sought other views. This post presents a personal viewpoint, mostly on technical considerations. Readers should not rely on it for investment advice, but rather seek their own professional advisers input. Phoenix – like resurrection followed by another decline. This is a weekly chart which shows a rather alarming fluctuation in the share-price over the last few years, ranging from a low of 19 cents to a high of 51 cents. As politicians will attest, a week can be a long time, and usher in extensive change. Corporate change and turn-around on the other hand seems to be painfully slow and protracted, particularly for those who are looking for a quick market response. However it is to be expected that in the 18 months that has passed, there will have been substantial change. The chart tells the story of this change, with Paragon expanding its operations by the take-over of LR Instruments, and Richards Medical for $5.3 million on the 13/11/2013, funded by a $6.7 million capital raising at 37 cents. 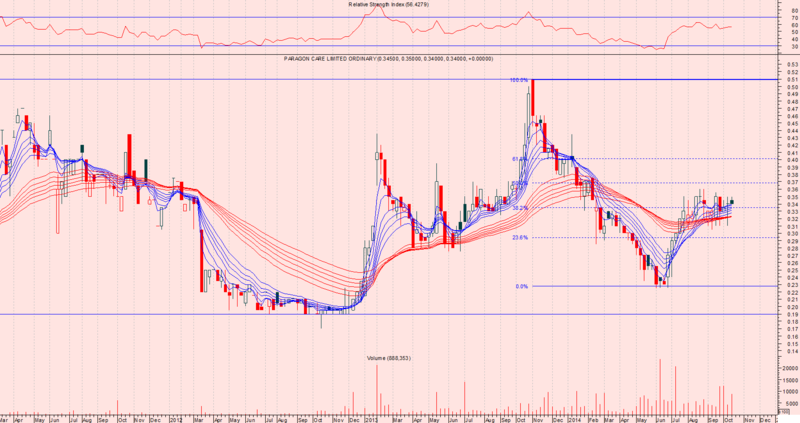 Interestingly 37 cents is the 50% Fibonacci level for this retracement. Underwriters were Halcyon and CCB Stratton Equities. 10,890,000 new shares were issued, diluting existing shares by 10%. The Market Cap is now $22.16 million. The 51 cent high was reached a few days prior to the announcement of the capital raising for the acquisitions. Bargain hunters exploited the ensuing price weakness and were able to buy shares as cheaply as 22.5 cents on-market, before recovering to near the issue price. Earnings Per Share at 2 cents. The P/E ratio is now 17, and the Forward P/E (30/6/16) is 6.8. It is a thinly traded stock, and still a somewhat pedestrian performer, but one that is becoming more profitable. Claude Walker, The Motley Fool, July 16, 2014, has a 38 cent target for it, but my immediate target would be 40 cents. Paragon Care Ltd. (ASX: PGC) supplies surgical instruments, medical equipment and consumable medical products, largely to hospitals. It is therefore somewhat dependent on the unpredictable flow of orders from hospitals. Because the company is basically a middleman, it also risks being cut out of the equation altogether, if it increases margins by too much. This isn’t the kind of superstar business I generally look for. On the other hand, the company tends to grow by acquisitions, and this makes sense if that strategy generates synergies and economies of scale. At the current share price of 29.5c, the company trades on a FY 2015 P/E of less than 10. After raising capital at 37c the company has a reasonably strong balance sheet. Furthermore, the company recently signalled the intention to make another acquisition in the short term (using debt). The business is a bit too unpredictable for me at current prices, but I’d be interested should shares become a bit cheaper, or if the new acquisition has particularly strong growth prospects. ‹ Sunbridge Group Limited: a net-net gem or trap? SHARE PRICE NOW 70 CENTS , 3 NEWW ADD ON COMPANIES AND TURNOVER TO TRIPLE. OUT OF MICRO TO MEDIUM SIZE COMPANY , THE BEST IS YET TO COME.